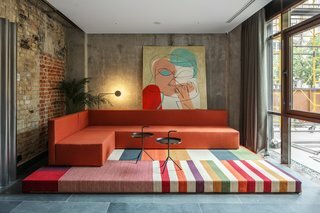 Founded by 24-year-old Russian entrepreneur Vasily Grogol, BURSA is a new hotel that includes a non-commercial art gallery, 33 contemporary guest rooms, a ground-floor restaurant, and a top-floor bar that opens onto a rooftop terrace. Located on 11 Konstiantynivska Street in Kiev, Ukraine, the 20,451-square-foot hotel complex was designed by local practice Balbek Bureau. The project renovated two historic buildings—one is 100 years old, and the other is about 200 years old—and connected them to a newly built, modern block to create this cool and dynamic space. Founded by 24-year-old Russian entrepreneur Vasily Grogol, BURSA is a new hotel that includes a non-commercial art gallery, 33 contemporary guest rooms, a ground-floor restaurant, and a top-floor bar that opens onto a rooftop terrace. The 20,451-square-foot hotel complex was designed by local practice balbek bureau. "The idea was to link two old buildings with a modern block, where appreciation of history and tradition will co-exist with modern art, design, and innovation," says balbek bureau’s founder, Slava Balbek who worked with fellow architect Andrii Berezynskyi on the redesign. BURSA's reception desk is composed of scrunched-up metal sheets set behind a glass panel. The public lounge area in BURSA Hotel. BURSA Hotel's 1818 rooftop bar. The rooftop bar looks out over the city. BURSA Hotel's Beliy Shum restaurant. A corner table at Beliy Shum restaurant. A guest suite with a pink Muuto Tip table lamp. Exposed ceiling pipes give this bright bedroom a cool, industrial aesthetic. "Our conceptual approach was that of an ‘adaptive reuse,’ allowing the building to preserve its historic integrity and aesthetics while providing for the needs of modern occupants," says Balbek. This guest suite features whitewashed brick walls. A Muuto “Cosy In White” table lamp. “With their careful planning, use of light and color, and the elimination of all unnecessary elements, even the smallest room in the hotel feels spacious,” says Kurilenko. One of the bathrooms is conceived as a modern glass box. The frieze supporting the bar in Belyi Shum Cafe features bricks made in the same year as the oldest building.